After an extensive 2015 world tour in support of “Rock Or Bust”, AC/DC continued the trek in 2016 with a series of US dates in early February. Following the band’s February 28 show at the Sprint Center in Kansas City, MO, AC/DC halted the tour with news that they would reschedule the remaining 10 dates on the U.S. leg following word that lead singer Brian Johnson had been advised by doctors to stop touring immediately or risk total hearing loss. With various rockers offering to step in for Johnson, rumors out of Atlanta, GA surfaced in late March about the possibility of Axl Rose joining the lineup after he was spotted by a fan in the city before the paparazzi located the Guns N’ Roses leader at a rehearsal studio. On April 16, AC/DC officially announced that Axl Rose would join them for the remaining dates on the tour, including a spring European run and, later, a series of rescheduled US concerts in the fall. Rose celebrated the news by having AC/DC guitarist Angus Young join GNR for a rare guest appearance during their headlining set at Coachella on April 16. Johnson issued his first public statement on his health status and the Rose situation a few days later, admitting his hearing had been failing for some time, that he was being treated for it and had no plans to retire. A statue of AC/DC legend Bon Scott was officially unveiled in the late singer’s Scottish hometown of Kirriemuir on April 30 as part of the town’s 10th annual BonFest event. 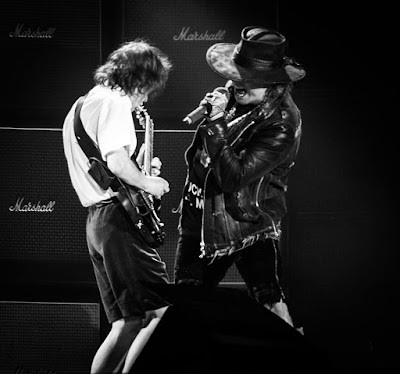 In early May, Rose revealed to the BBC that he landed an audition with the band through a mutual associate – their shared production manager – before making his AC/DC debut in Lisbon, Portugal on May 7. The frontman broke his foot during an April 1 GNR club show in Los Angeles, which put him in a walking boot for the next several months; as a result, Rose performed the spring dates with his own band and the early AC/DC concerts while sitting atop a throne on loan from head Foo Fighter Dave Grohl after his own leg injury during a summer 2015 tour. Late May saw Johnson reveal that his hearing issues originally began approximately eight years ago while racing at the Watkins Glen International and had worsened due to an illness on tour in September 2015. AC/DC wrapped up their European leg of the tour in Düsseldorf, Germany on June 15; hennemusic streamed each of the 13 shows live with the help of fans at each event. In early July, bassist Cliff Williams announced plans to retire from the band after 40 years at the completion of the fall US dates, which opened in Greensboro, NC on August 27. The 10-show run wrapped up in Philadelphia on September 20 with the band saluting Williams at his final AC/DC show. Estranged drummer Phil Rudd was recovering from a heart attack at the end of August, and shared plans to launch a comeback now that an 8-month home detention and a further six months of post-release conditions had expired following a series of legal troubles in New Zealand that sidelined him from joining AC/DC for the world tour. Earlier this month, Rudd announced dates for a 2017 European run while AC/DC landed at No. 7 on Forbes List of Highest Paid Musicians of 2016 with earnings of US $67.5 million from the tour – not including numbers from the rescheduled fall US shows. AC/DC’s future remains a mystery as 2017 arrives. Angus Young is the lone remaining original member of the group after a number of changes in recent years, including the 2014 retirement of founder Malcolm Young due to dementia, a series of legal issues faced by Rudd, the spring 2016 departure of Johnson, and Williams’ retirement.